This morning, flowers of Penstemon heterophyllus ‘Electric Blue’ and multi-colored P. ×mexicali hybrids bloom in profusion in the 800-square-foot area. 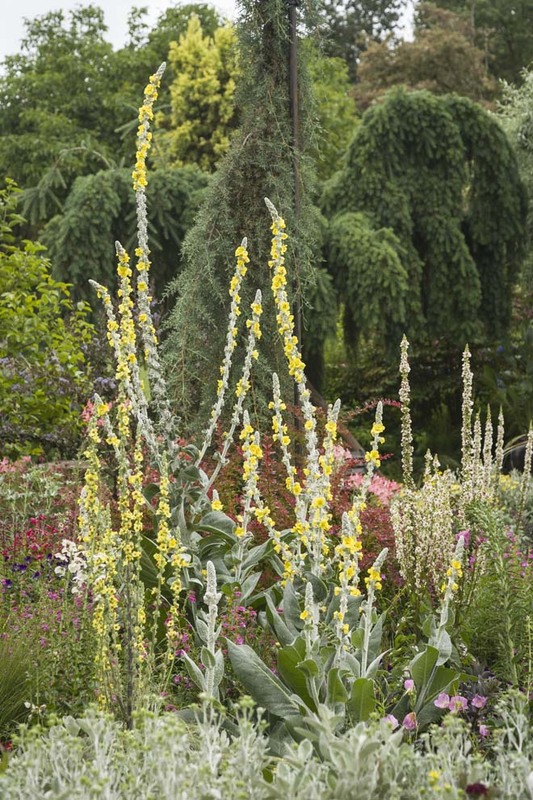 Stately Verbascum bombyciferum ‘Arctic Summer’ stands among dark-leaved shiny sedums. 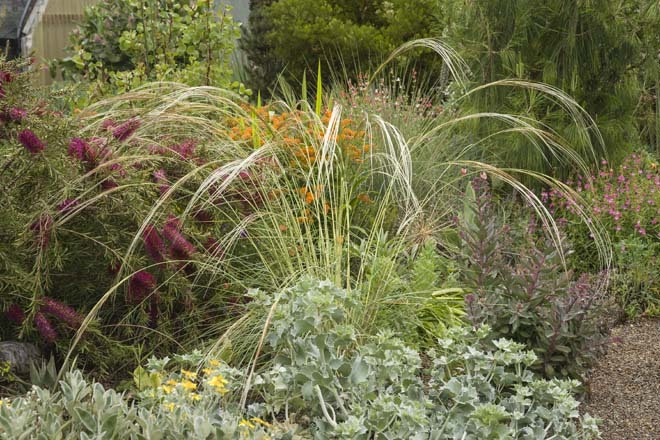 Waving mounds of grasses punctuate the gravel—the narrow green leaves of Stipa barbata, golden panicles of tall S. gigantea, and the maroon awns of Molinia caerulea ‘Strahlenquelle’. “The name means ‘source of rays,’” notes Marietta referring to the purple moor grass’s German sobriquet. On this 90-degree day, Marietta and Ernie are swathed in sun hats and heavy gloves. With their water bottles at the ready, they are clippingfoliage, deadheading, talking about their favorite plants, sharing advice, and finishing each other’s sentences. I settle on a bench in the welcome shade of a Genista aetnensis, Mount Etna broom. Its limbs are festooned with sweetly scented yellow blossoms. I comment on the delightful aroma. I’ve never conducted an interview while the participants work, but why not? The couple’s life has been dominated for over 40 years by plants. Marietta and Ernie are the developers of the popular Winter Jewels® hellebore series. Northwest Garden Nursery, their wholesale hellebore operation, started out as a small-scale retail business to support the couple’s enthusiastic plant collecting. 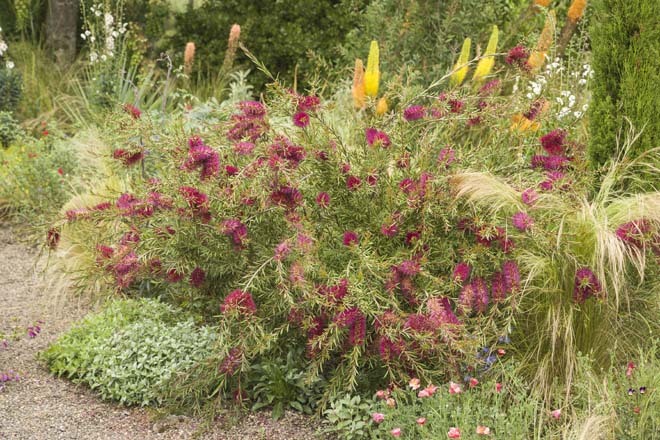 “We couldn’t buy what we wanted to grow,” says Ernie, “so we thought we’d do it ourselves.” They displayed many of the unusual plants they sold in a series of outdoor rooms covering an acre and a half around their 1918 farmhouse. “Of course a vegetable garden was first,” Ernie notes. 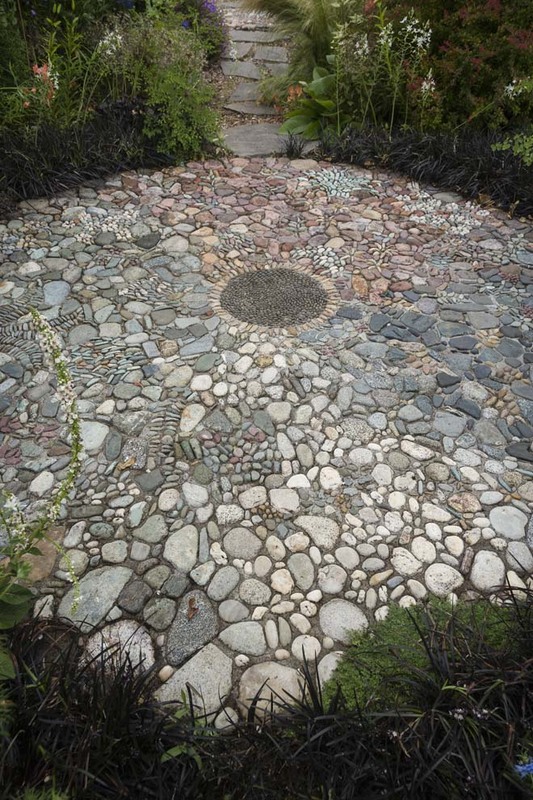 Then every few years they developed another section, including a woodland walk, a rock garden, an area of mixed conifers, and two long perennial borders that flank a basalt stone walkway with a concrete and river rock mandala by artist Jeffery Bale at its axis. It’s no exaggeration to say the O’Byrnes think, breathe—and even sleep—plants. Not only does Marietta admit to waking in the middle of the night mulling over new garden designs, but on warm summer evenings, they tell me, the two of them roll out their sleeping bags on that stone mandala. They drift off under the shifting stars, amid the scents and sounds of their garden. They’re roused in the morning by the clashing whir of dueling hummingbirds among the perennials. That penchant for a purpose-built outdoor life of gardening, camping, hiking, and traveling the world— along with those homegrown vegetables—has allowed them both to stay lean and fit. 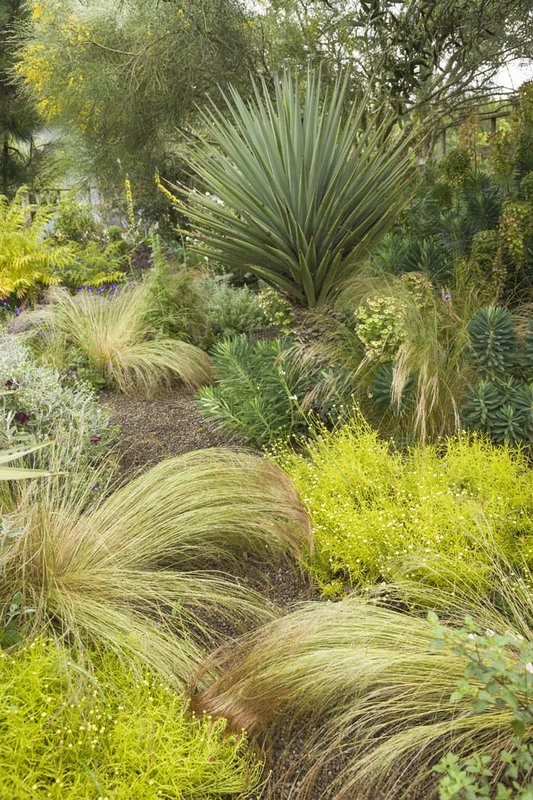 They work the garden, bending over the plants with the grace and ease of long experience. 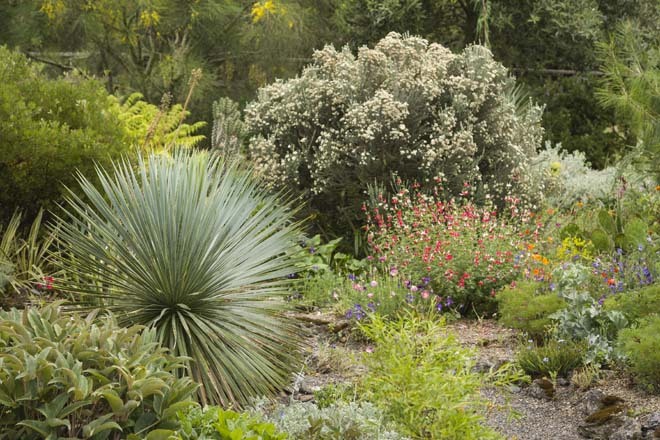 With the chaparral garden, they finally achieved their water-wise goal. “We had a huge garden,” Ernie says, “and we still didn’t have a place to grow plants that didn’t want water.” Ten years ago they moved part of the chicken yard and built the chickens a handsome new cedar-and-wire fence that forms the eastern boundary of the drylands area. Without digging into their sandy soil they piled up mounds of gravel between eight and twelve inches high. “If it were clay,” Ernie says, “I might have loosened it a bit.” They brought in local basalt gravel, quarter-ten open, which is screened for smaller debris and top-dressed with pea gravel for its interesting colors. “And it’s easier to pull the weeds,” Ernie notes. 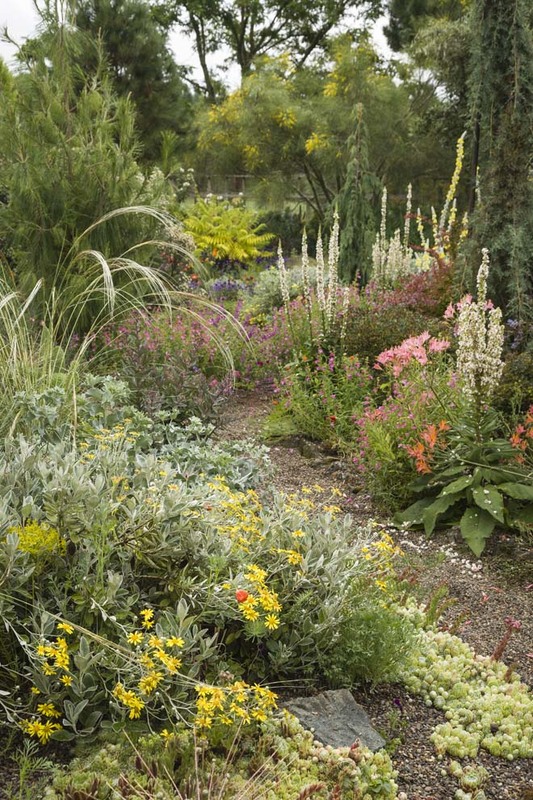 They use it for the pathways as well, renewing the garden each year with more as the stones mix into the soil below. At first, it seemed impossible that the plants would grow into the gravel. The couple kept pulling the stones back and adding more organic matter. “But then we saw how everything took off—” says Ernie. “—and things like penstemon and salvia did so much better,” adds Marietta. 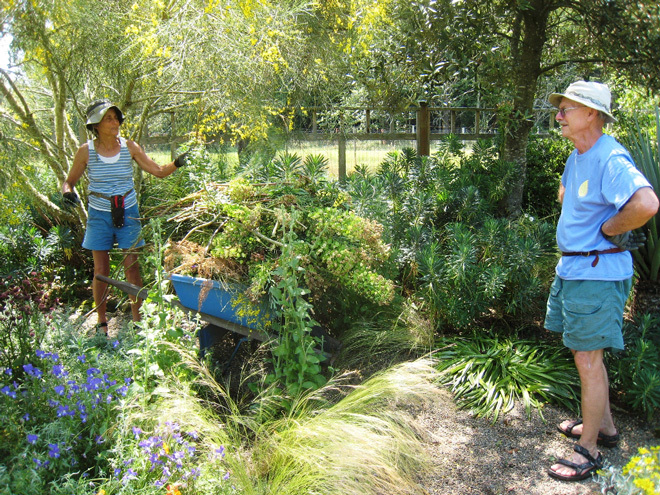 Giving over control to the plants is one of the pleasures they both appreciate about gardening their chaparral area. Many plants volunteer. Marietta points out the Alstroemeria ligtu hybrids that keep displaying interesting new colors and low-growing purple-leaf sedums as examples. However, profligate self-seeders do require some intervention. Marietta ruthlessly rogues out the orange California poppies that show up in the mix Eschscholzia ‘Thai Silk’—“Otherwise, after a while they’re all orange.” When they finish blooming, she cuts them back by half for a second flowering. She places small sticks next to favored colors so she can come back and gather seed, which she scatters around the beds. Most xeric plants prefer sun. The couple chose fastigiate trees for their dramatic shapes and narrow shadows. They planted weeping Alaska cedar Chamaecyparis nootkatensis ‘Van Den Akker’—“It’s even better than ‘Green Arrow’,” Marietta observes—and a weeping form of Douglas fir, Pseudotsuga menziesii, pruning the lower branches on the fir so they can sit under it. They also trim up the bottom branches of manzanitas like Arctostaphylos ‘Austin Griffiths’ and A. ‘Howard McMinn’. “Those branches die anyway, and it looks messy and dense,” observes Marietta. “It’s really nice wood—” Ernie says. Pruning creates more planting space underneath the tall plants often given over to bulbs such as crimson red Dichelostemma ida-maia, the yellow-flowered Triteleia ixioides ‘Starlight’, or the multi-pastels of Cyclamen coum. 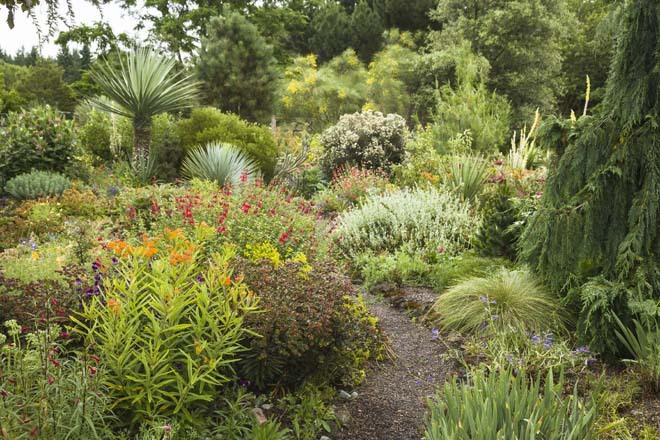 Of course, this garden is in the Pacific Northwest; they acknowledge the differences. “We get rain instead of the snow that some of these high mountain plants need,” Ernie says. 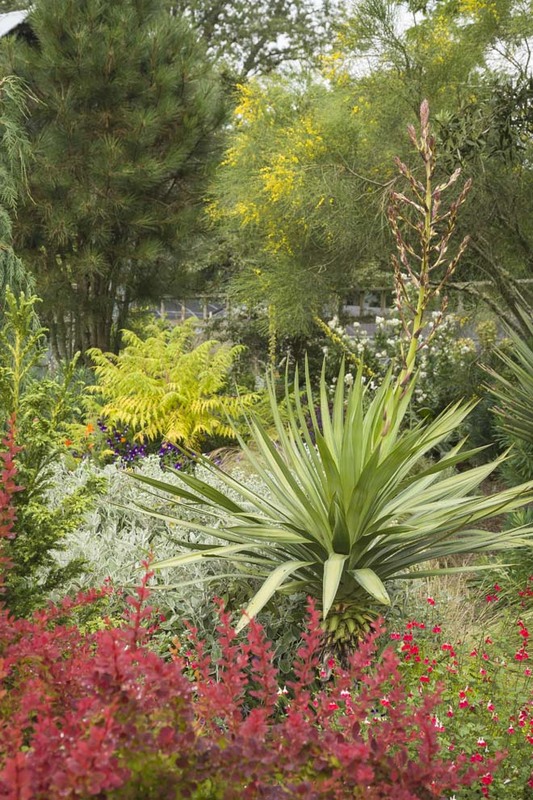 They don’t remove the lower browning leaves on Yucca rostrata ‘Sapphire Skies’ to give extra winter protection to the trunk. But they do cut off the bottom growth on the hardier Y. ×schottii. “They get black spot,” says Marietta.